It's beginning to look a lot like Christmas! Welcome signs include beautiful images of reindeer, candy canes, and sleigh bells; visions of snowmen, nutcrackers, and ornaments; a host of pinecones, poinsettias, and more. Just add your own colors, using fine-point markers, felt-tip pens, or an array of colored pencils, to these festive holiday designs. Full-page patterns with heartwarming holiday details, these 31 bordered images will be on everyone's wish list! 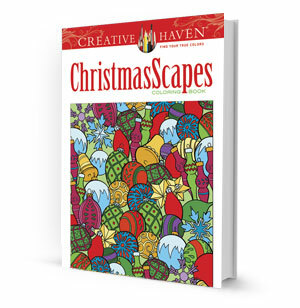 Includes 31 intricate designs of reindeers, candy canes, sleigh bells, and snowmen. Features nutcrackers, ornaments, pine cones, poinsettias, and of course, Santa Claus. Bring hours of fun and relaxation to your Christmas season.